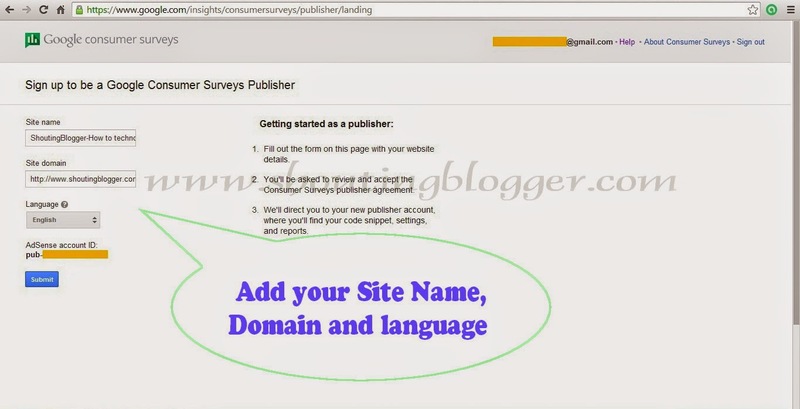 How to Create Google Consumer Survey Publisher Account. Google consumer survey enable the webmaster to make money by monetizing their website or blog with the survey ads. The website or blog which is monetize with Google consumer survey ads will pop up with the Short length survey window with the option to skip and answer, For every successful Survey answers completion, AdSense account credit with $0.05 or local equivalent for each answered question. Google consumer survey publisher requirement. To Get accepted as Google consumer survey publisher, one must have valid Google AdSense account . AdSense account must be in good standing . Website content should be free from spam content, Adult content and must adhere and follow all Adsense Tos. To monetize your website/blog content with Google consumer survey advertisement, one must have valid adsense account. If you already have your AdSense account approved then login to your Google AdSense account and If you don't have Google adsense account already then create one and get it approved. Sign-in to your Google AdSense account. Now, To create Google consumer survey account go to http://www.google.com/insights/consumersurveys/publishers. Step 2: Click Add surveys to your site . Now look for " Add surveys to your site " button and click on it. 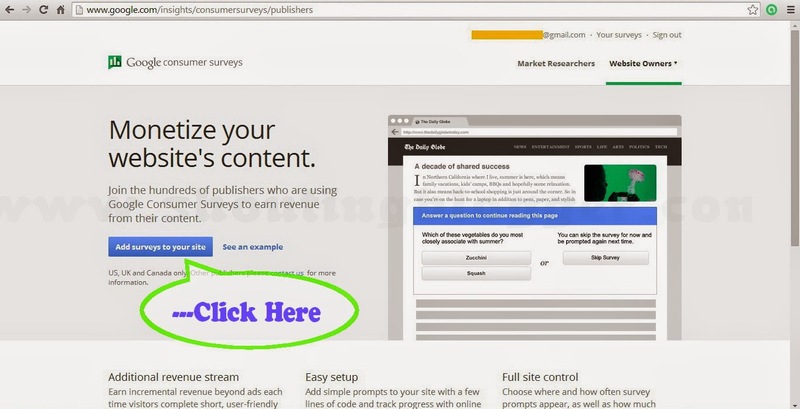 Under "Sign up to be a Google Consumer Surveys Publisher " label , Fill the Site name,Site domain, Language of the website you want to monetize with Google consumer survey ads and hit submit button. Step 4: Google consumer survey Code implementation. To Start Showing surveys on your site, implement code on your website. When you hit "submit " Button , you will be directed to Publisher setting window, Under that you will see code instruction, Settings and report . To enable surveys on your site, you need to add Primary code that appears below "Add our script to your site" just right after your website <body> tag. The above code is necessary part in making Google Survey ads visible on your website. If you don't add the above mentioned code then your Google survey ads won't function. The next part is implement code under "Wrap your premium content " on website content . Paste this code where your want to see your survey ads to appears . On implementing Google consumer survey code correctly, you website start to appear with test survey ads. These test survey ads will not generate any revenue, do not remove them as these are needed to review Google consumer survey application. These test unpaid test survey will run for about 7-10 days. 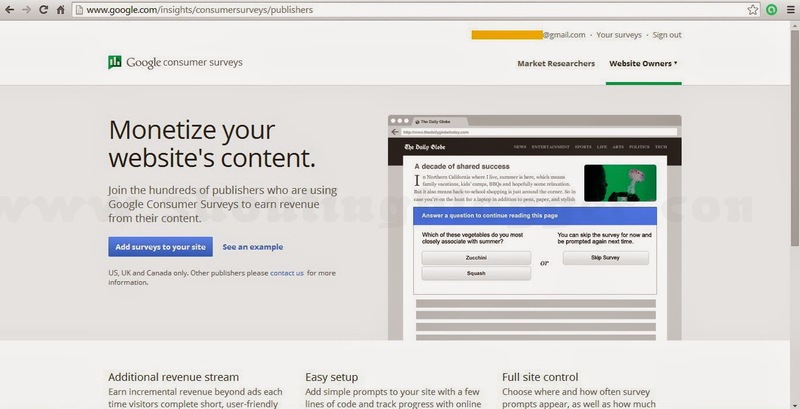 Once Google consumer survey application approved your site will start to show paid survey and all the earning will be added and viewed under Google adsense " Earnings - Google Consumer Surveys "